Universal central vacuum hose set. Replaces any brand pig tail hose set. 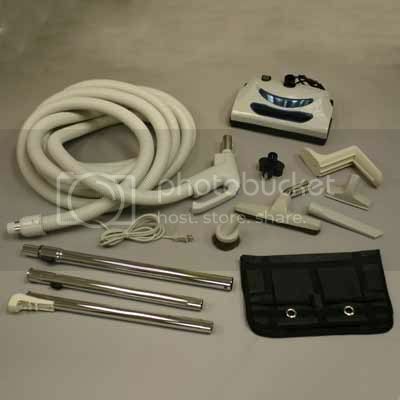 An entry level priced hose set with deluxe hose set features. Including a dual brush, metal brush roll , 30 ft crush proof hose, and deluxe tool set. The Majestic central vacuum electric powerhead and hose set gives you a deluxe powerteam at a economical price. This head features a dual brush, metal brush roll usually only found on the highest end models. It is our best seller because it comes so competitively priced yet has all of the deluxe features of the more expensive hose sets. Where most entry level powerheads include a single brush, plastic brush roll and a flat belt this powerhead has a metal dual brush and a cogged belt that is designed to last for 10+ years. Most flat belts have to be replaced every 2-5 years. Do not be mislead by the price of this hose set it is superior to all entry level hose sets and on par with some of the very best ones on the market.